Zebra stripes have intrigued scientists for over 150 years, and now a study has found that the primary purpose of the animal's two-tone coat is to confuse bloodsucking flies and avoid disease-causing parasites. Many theories have been proposed, including avoiding predators, better heat regulation and a social function, yet there is still no agreement between scientists. Now, researchers from the University of Bristol in the UK and the University of California (UC) Davis in the US have added evidence to the theory that the primary purpose of zebras' stripes is for avoiding blood-sucking parasites. The researchers investigated the behaviours of tabanid horse flies around captive zebras and domestic horses at a livery in North Somerset, using video analysis techniques. The study, published in the journal PLOS ONE, has shown that stripes do not deter horse flies from a distance, with both zebras and domestic horses experiencing the same rate of circling from the flies. However, video analyses revealed differences in approach speed, with horse flies failing to slow down on approach to zebras, which is essential for a successful landing. "Horse flies just seem to fly over zebra stripes or bump into them, but this did not happen with horses. Consequently, far fewer successful landings were experienced by zebras compared to horses," said Professor Tim Caro from the University of Bristol. "This reduced ability to land on the zebra's coat may be due to stripes disrupting the visual system of the horse flies during their final moments of approach," said Martin How, Royal Society University Research Fellow at the University of Bristol. "Stripes may dazzle flies in some way once they are close enough to see them with their low-resolution eyes," How said in a statement. Their second experiment was to observe horse fly behaviour around the same horses wearing different coloured cloth coats: black, white or zebra striped livery. This excluded any differences in behaviour or smell between horses and zebras. Just as before, when horses wore coats with striped patterns, they experienced fewer horse fly landings compared to when they wore single-colour coats. Horse flies are a widespread problem for domestic animals so mitigating techniques, such as the development of anti-fly wear designed to resemble zebra stripes, may, from this research, be an interesting outcome for animal health and wellbeing. The research also directly observed zebra and horse behaviour in response to biting flies. Zebras exhibited preventative behaviour, such as running away and tail swishing at a far higher rate than horses. Consequently, any horse flies that did successfully land on zebras spent less time there compared to those landing on horses, with few staying long enough to probe for a blood meal. In Africa where zebras are native, horse flies carry dangerous debilitating diseases such as trypanosomiasis and African horse sickness which cause wasting and often death, researchers said. It is unsurprising that zebras utilise both behavioural defences and morphological striping to avoid horse flies, they said. 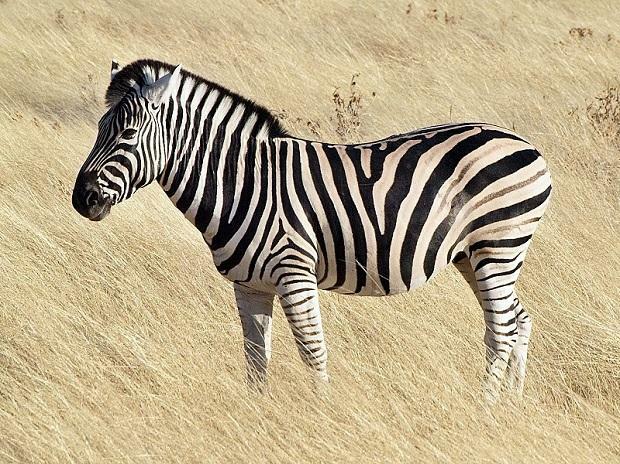 This research provides new evidence for the theory that zebras evolved dichromatic striped coats to evade biting flies and has considerable implications for the horse industry.